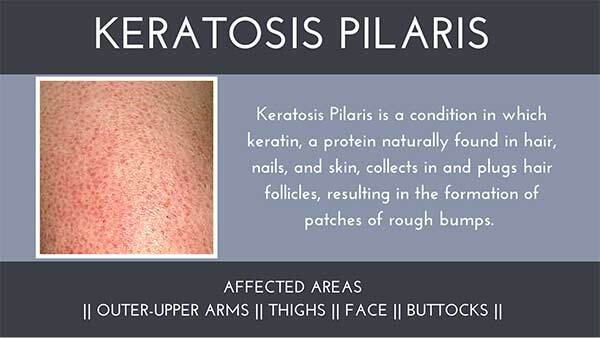 Keratosis pilaris is a condition in which keratin, a protein naturally found in hair, nails, and skin, collects in and plugs hair follicles, resulting in the formation of patches of rough bumps. Keratosis pilaris typically occurs on the outer-upper arms, thighs, face, and buttocks, though any area of the body can be affected except the palm of the hand and the sole of the foot. These bumps can occasionally itch, though this is rare. The cause of keratosis pilaris is unknown though it is exacerbated by dryness. Therefore, this condition has a tendency to get worse during the winter months when there is less moisture in the air, and is more likely to occur in individuals with a history of other skin conditions that cause dryness. Keratosis pilaris is known to occur during pregnancy and in the months following childbirth. It affects women more often than men, and tends to occur early in life, with most cases arising during adolescence and resolving in adulthood. A person is more likely to develop keratosis pilaris if their family has a history of this condition. Keratosis Pilaris is a completely benign condition that usually resolves itself with time. Therefore, it is left untreated in the majority of cases. Furthermore, there is no single cure for this condition, with best outcomes achieved with multiple simultaneous therapies. Common to all treatment approaches, however, is the need for continuous use of an over-the-counter moisturizer combined with regular exfoliation of affected areas. This alone can greatly reduce the appearance of keratosis pilaris, though additional therapies are often necessary for complete clearance in most cases.